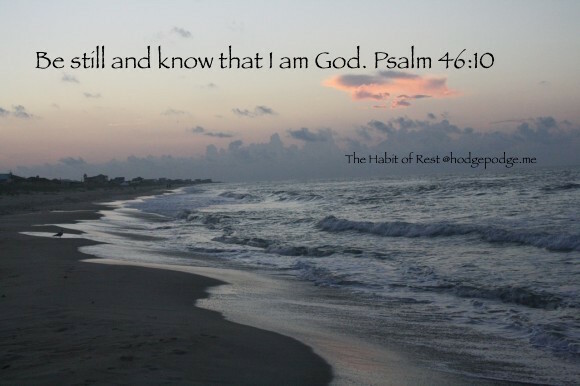 The Lord has been reminding me that rest is what I need. He’s been reminding me of the habit of rest. His habit of rest. He’s been telling me for several weeks. Step back and rest. But, I must admit, I have been like Jonah. I’ve heard The Lord’s quiet whisper that I need to rest but I’ve still been running. Keeping on keeping on. I’m a busy mama and have this family to take care of. So I kept going. I was also forcing myself to start thinking and planning for next school year. There’s so much to do with a senior year on the horizon. And another senior year right after that one. But I was running on empty. Stress led to knee inflammation. I rested some but got right back up. Then I injured my back from compensating for my knee. This next time was forced rest. Flat on my back was about all I could do for five days straight last month. I read an entire book. And it was pure pleasure. I rested. Really rested. Friends, His power is made perfect in weakness. But the Lord won’t let me go. Now I need to listen and obey. I need to rest. To step away. To really listen to His voice. To rest. To play. It’s the very first step in that free Return of the Routine ebook I shared. You may still be feeling the weight of last year. Or you may be facing the overwhelming responsibility of the new school year. Allow yourself some rest. Pray that the Lord give you the motivation you need in the proper time. It will come. Don’t force it. Lean into Him and listen. Jesus set the example in getting away and getting with the Father. It’s been a long year. But you have rested a little while, and there are tasks calling. You might, just possibly, gain a bit of leverage by starting to work now, filling your sacks of heavy sand and beginning the line of a wall along the river of next year’s demands. The river will rise. We all know it. Not next week, but maybe in a month, certainly in December with the storms of busyness over the holidays, and likely in the spring with all of its expectations. But now, at this moment, your world is calm. The house rests, because you, Mama, are resting. Didn’t you know that? That your family can’t really rest, not sink deep into comfort like a downy pillow on a rainy afternoon, unless you are resting, too? Your body at rest, and your mind at rest, and your heart at rest, cast a blessing of rest over your small world. —> Please read the remainder of Rest, Mama. We are not going to plunge head first into a routine. We are going to baby step it. Still that feeling of overwhelm. Just rest for now. And as you rest, talk to the Lord about the coming year. Your dreams, your concerns. Place them all in His hands. Have you rested? Are you pulling last year’s burdens into this year? Overwhelmed with the responsibility of the coming year? Talk to Him about it. Rest in Him. Friends, before we can even begin to return to a routine we need to take the time to take care of ourselves. I will be asking. Asking for wisdom. James 1:5 But if any of you lacks wisdom, let him ask of God, who gives to all generously and without reproach, and it will be given to him. 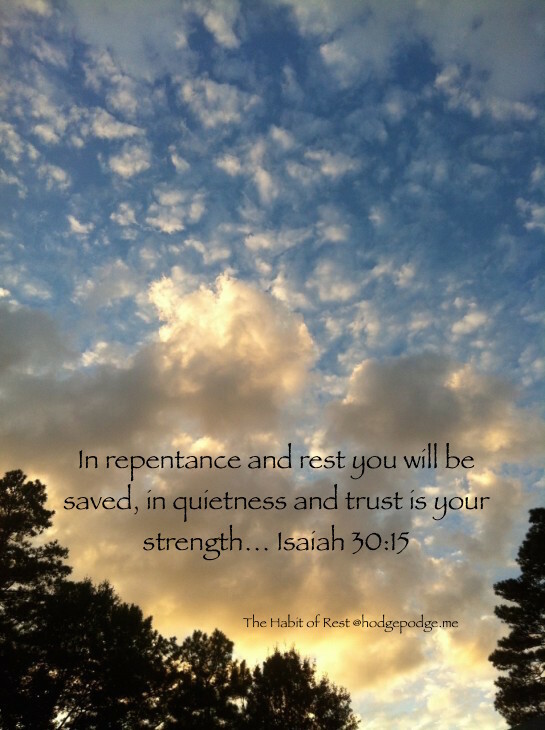 The Power of Rest: Let Patience Have Its Perfect Work – then I read this last Thursday. I will be back sometime in August with a fresh vision. Plus you just might notice a few updates around here. And since I’ve mentioned it, feel free to let me know what you enjoy most here at Hodgepodge. What would you like to see more of? Blessings on your time of resting in Him, Amy! Ah, just lovely, Tricia! Like a breath of fresh air. 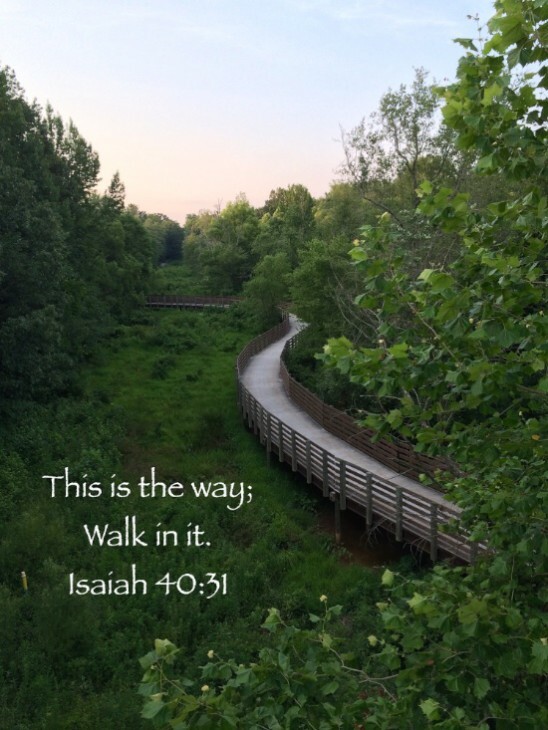 Thank you for including the Scripture verses…I’ll be adding them to my commonplace journal today! Peace keep you as you rest. Journaling is such a wonderful habit. Thanks for your kind words! It is so hard for us to rest, isn’t it? We always somehow think we are failing or lazy. Thank you, my friend for the reminder. Indeed it is! And you are right – there is that guilt. But we all need it. Rest well these weeks, dear Phyllis. 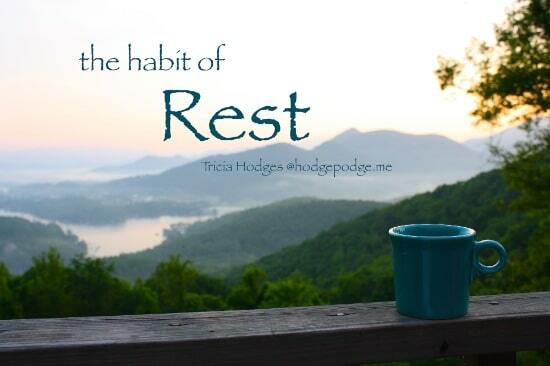 So many ways that I need to add some rest into my life…going to pray about it first and then make it happen. Thanks Tricia. This is just what I needed to hear today. I will be homeschooling my oldest son for 8th grade this year while his siblings will be attending public school. I have really been stressed lately because he has dyslexia and has a few anger issues. Thank you for these words that God wanted me to hear. Yes, Tricia, you rest. May God give you peace and relaxation and joy and all the rest you need. And the openness and bravery to change the things you will most likely discover need changing. Peace and courage, my friend, because God is in control! Amen! I am so glad that you are getting some rest. Please make it a tradition. This will be my 16th year of homeschooling, and I discovered last year that an overnight trip alone is just what I needed. I plan on making it an annual trip. A local Christian camp in my area agreed to renting me a room from them at the end of August. A time of solitude in the woods, praying, reading my Bible, and planning the upcoming year is just what my body and soul needs. Thank you for your post! Oh I love that idea Marcy!! How wonderful. Thanks for your encouragement.